Therapak’s Dual Click-Tite containers are ideal for maintaining the integrity of biological specimens during transport and storage. Dual Click-Tite caps “click” twice when closed, indicating the container has been closed securely and is leak-resistant for transport. Containers are stackable, graduated and include top and bottom knurls for ease of gripping with gloves. 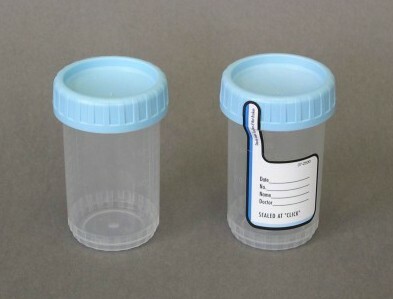 Sterile containers are complete with tamper evident label. Composed of 100% virgin polypropylene, these sturdy containers are 95kPa certified for air transport. Thinner sidewalls permit rapid temperature transfer for accurate temperature sensing of the specimen. 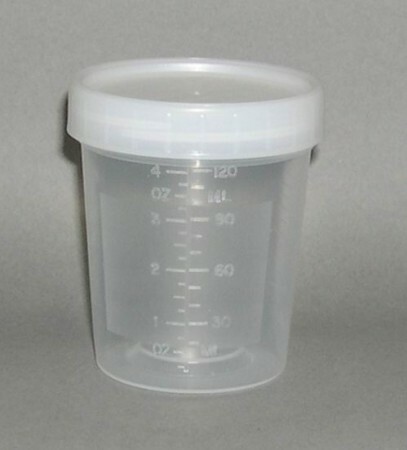 This wide-mouth cup is ideal for initial collection of urine samples and subsequent pour off into transport vials. The cup is graduated to 180 mL and its durable, break-resistant design is still flexible enough for squeezing on sides to direct pour off for convenient specimen transfer into transport vial. 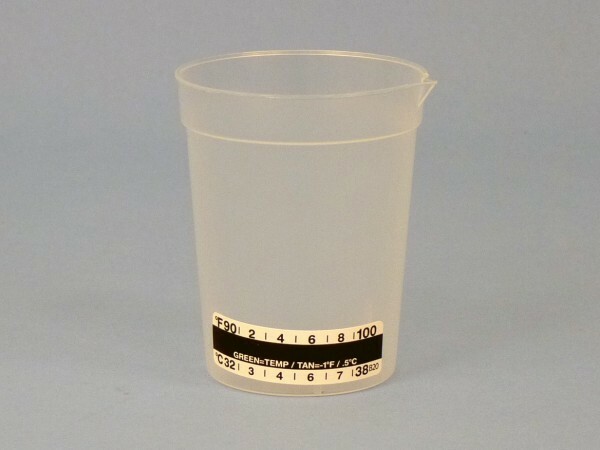 This cup is commonly used for collections involving substance abuse testing. Part number 74850 is inner packed 25 cups per sleeve. Part number 39416 includes a temperature indicator strip pre-applied to the collection cup. Part number 39473 is provided individually wrapped with a temperature indicator strip. 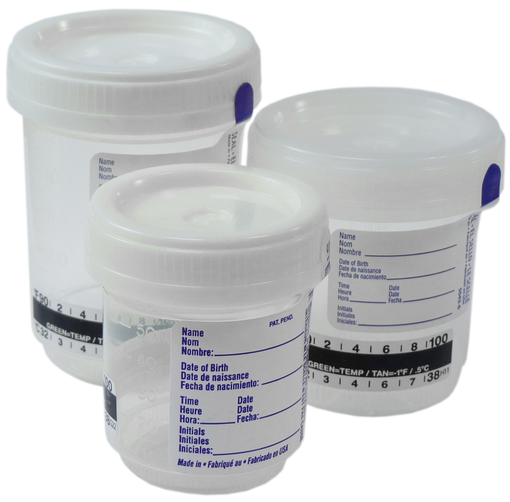 This miniature cup offers convenient collection and pour-off into urinalysis tubes or transport vials. The cup is graduated to 90 mL and can be stacked when being stored prior to collection. Premium quality, BioStor™ Multi-Purpose Containers, with resealable lids, can be used to store almost any liquid, powder or solid. Ideal for laboratory or hospital use. 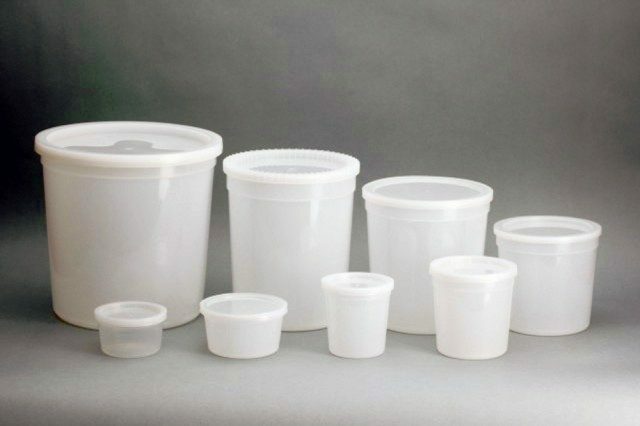 Injection molded of polypropylene or linear polyethylene, containers are virtually indestructible in normal use. Resistant to boiling and freezing temperatures (+100°C to -100°C). Inert to most lab chemicals including formaldehyde, weak acids, organic solvents, and all bases. Stable, wide-mouth design allows for ease of filling and is less likely to tip over, even when stacked. Tight-fitting, snap-cap lids keep odors in and minimize chance of leakage. Contents are visible on contact with translucent plastic walls. Priced low enough to be disposable, yet sturdy enough for reuse. Lids may be custom imprinted for large volume users with specialized applications. MPCP-F003 BioStor™ flat, polypropylene 2.75″ dia. MPCE-F007 BioStor™ flat, High-Density Polyethylene 3.4″ dia. MPCE-T008 BioStor™ tall, High-Density Polyethylene 2.75″ dia. MPCE-T016 BioStor™ tall, High-Density Polyethylene 3.4″ dia. MPCE-T032 BioStor™ tall, High-Density Polyethylene 4.5″ dia. MPCE-T064 BioStor™ tall, High-Density Polyethylene 5.5″ dia. MPCE-T083 BioStor™ tall, High-Density Polyethylene 5.75″ dia. MPCE-T165 BioStor™ tall, High-Density Polyethylene 7.75″ dia. Therapak’s commode collection system features a wide lip that fits the perimeter of most standard toilets, which prevents tipping. Inside is clearly marked with easy to read graduations. 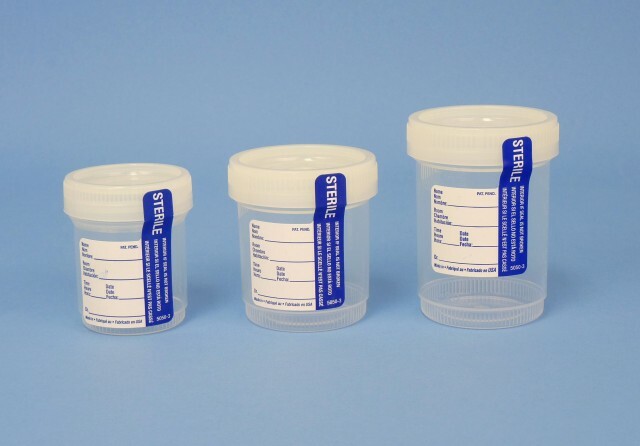 Ideal collection unit for urine, stool, and kidney stones. 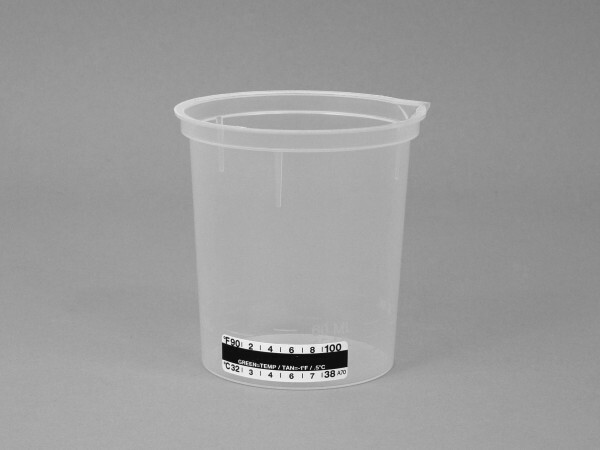 This collection cup is used for in-house specimen collection and analysis. 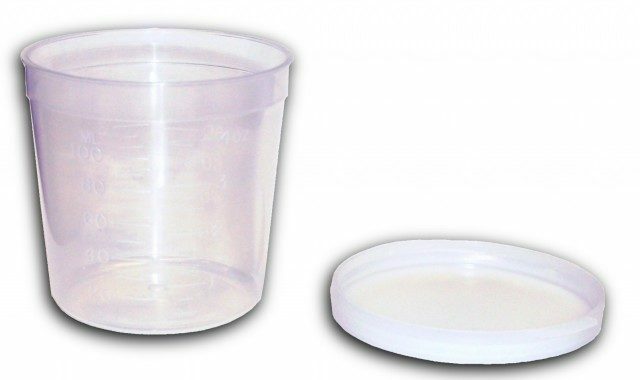 Non-sterile cups and lids are packed separately. These containers are specifically designed for safe, secure collection and transportation of biological specimens for laboratory evaluation. The container features accurate, easy-to-read, molded-in graduations on three sides. Top and bottom ribbed etchings ease the opening and closing process when wearing examination gloves. Containers are flexible, crack-resistant and are manufactured from virgin, high clarity, chemically inert, medical grade polypropylene. Heavy duty polyethylene screw caps feature a unique dual fill circle thread design which provides a tight, leak-proof seal. Listings below include natural caps. For color-coded caps, call Therapak customer service for details. Made of clarified polypropylene with graduations at each quarter ounce and every 10 mL. Lid snaps on for a tight seal. 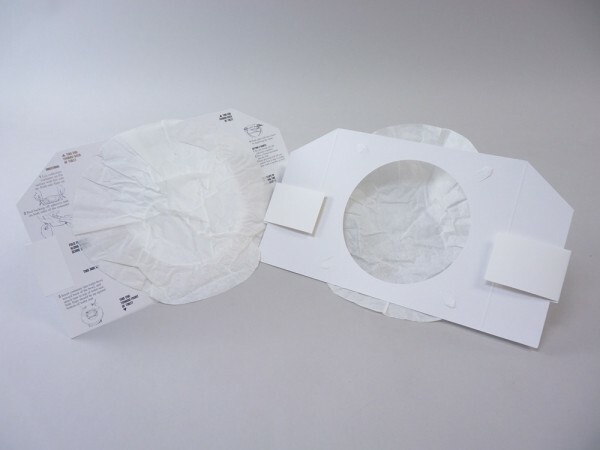 The paper folding collection device consists of a disposable, water-resistant frame which supports an attached tear-away paper collection bowl as well as removable adhesive strips on either side allowing device to be securely anchored to commode. The device is pre-printed with easy to follow instructions, lightweight at only 17.5 grams and ships flat (Product Dimensions: 305 x 170 mm). Collection cup features a wide mouth for voiding the initial specimen prior to rapid test screening. 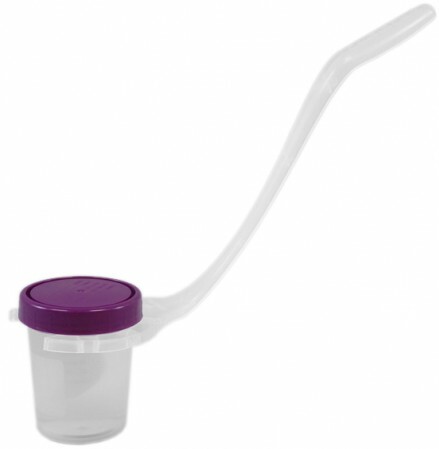 The 240 mL cup is molded with a pour spout for convenient specimen transfer into transport container. Part number 75187 includes a temperature indicator strip pre-applied to the collection cup. The FOLDaCUP is designed for use by patients recording intake or bladder diaries at home. 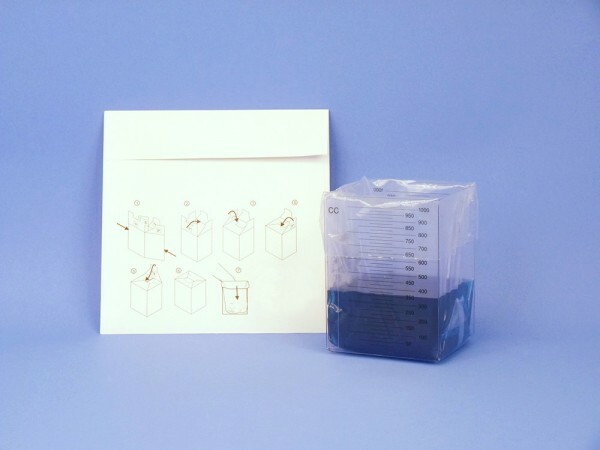 It is supplied folded and packaged in an envelope with clear assembly instructions. Once erected, the cup measures approximately 5.5” high x 3.75” wide x 3.25” in depth. Instead of having to ship a hard-wall container to the patient, the FOLDaCUP can be affordably mailed or conveniently handed over to the patient in the same envelope as the diary form. 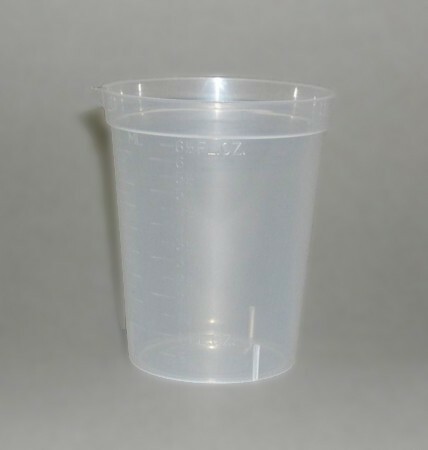 The 1,000 mL capacity cup is graduated for easy measuring and its portability facilitates use away from home. The CareFull Catch Disposable Specimen Collection Cup Holder is an innovative new product designed with your patient’s comfort in mind. CareFull Catch’s angled handle allows for ease of use for caregivers when assisting patients, and comfort for patients collecting samples independently. 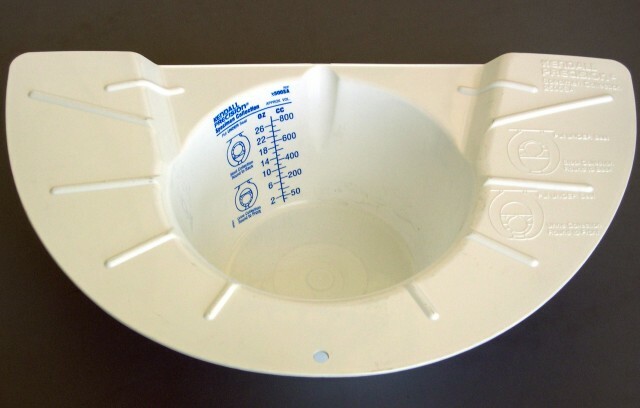 The unique design positions collection cups directly into the path of the urine stream without patients or caregivers having to position the cups with their hands. This results in an improved experience and lessens the risk of sample contamination or unsanitary conditions. CareFull Catch is also used during toxicological screenings when a patient must be observed during the collection process, keeping the patient’s hands in sight.